Weight loss- It can aid in weight loss. There has been many studies done that show it has an effect on your body to loose body weight, lower waist circumference, and triglyceride levels. Teeth-It can remove stains from your teeth. Dip your toothbrush in it, and brush/rub it across your teeth. Acne- Dilute a cotton ball or washcloth with ACV and lightly rub onto your face. It will restore your faces Ph level. Leaving your face feeling soft and smooth. Sunburn-Have a sunburn? It will stop your sunburn from peeling! Just dab some on a cotton ball and rub it on the sunburnt area. Skin tags- ACV can eliminate warts and skin tags. Just apply ACV onto a cotton ball and rub over every day for 5 days. For more of an aggressive approach you can dab on a cotton ball and leave on overnight. 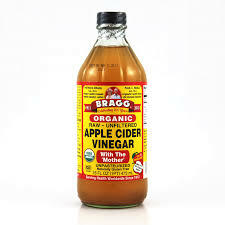 Acid indigestion- ACV will help with any digestive issues including gas, constipation, and acid indigestion. Balancing Ph- It can help your bodies ability to maintain a proper Ph. It will help your body keep an alkaline ph level and equilibrium, while detoxing the liver and giving you more cardiovascular circulation. Menstrual cycle- It can help reduce the amount of blood lost during your cycle. Yeast infections- It can help your body flush out candida (yeast). Which can cause Fatigue & cravings also. *Make sure the Apple Cider Vinegar you use is raw and unfiltered! I was reading the post about the benefits of apple cider vinegar. You said you use it while fighting the flu. If you do not mind I would like to ask what is your recipe for the flu fighter. Hi Agata! Yes, it is four pages in under my recipes tab, but I will post below.. Combine all of these ingredients in a blender until liquefied. Makes about 8-9oz!